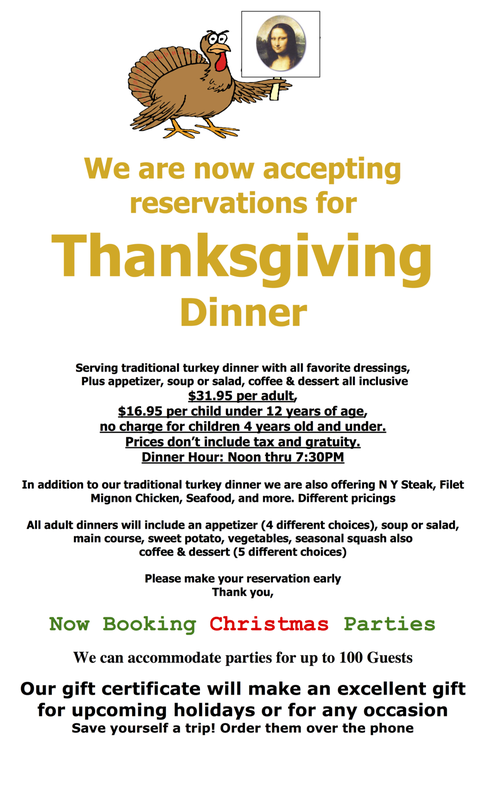 Thanksgiving and Christmas reservations are open! Treat your dad to a meal at Mona Lisa for Father's Day! Book Your Mother's Day Reservation Today! Book your Easter Dinner reservation today! Join Mona Lisa for St. Patrick's Day! Book your Valentine's Day reservation today! Super Bowl LI at Mona Lisa! Happy Holidays from Mona Lisa! Try out our new Goat Cheese Stuffed Figs and some new cocktails! While you're at the bar, why not try some of our new drink specials? Clockwise from the left: Mango Margarita, Triple Berry Martini (made with fresh organic berries), Watermelon Mojito, and in the mug is our Moscow Mule. Treat Dad to A Great Meal on Father's Day!